Jazz Zoom: carryin' it on [bardin1121] : Jazz Record Center, Rare and out-of-print books, records and more. A new addition to contemporary jazz literature, this 12 ? x 12 ? 136-page book is hardbound and slipcased. Printed on heavy coated paper, the black and white photos are beautifully detailed and have great contrast. 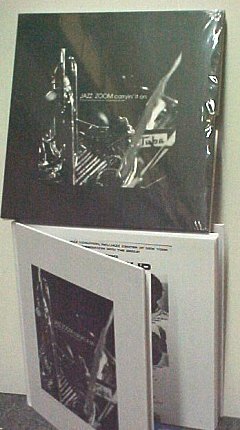 The book has photos, ephemera, excerpted interviews or commentary by over 70 contemporary musicians, e.g Albert Ayler, Lester Bowie, Leroy Jenkins, Anthony Braxton, Warren Smith, Henry Threadgill, Fontella Bass, Eddie Allen, Oliver Lake, Hamiet Bluiett, Pheeroan Aklaaf, Randy Weston, Sun Ra, Marshall Allen, Vincent Chancey, Craig Harris, Ahmed Abdullah, Billy Bang, Marion Brown, Fred Hopkins, Andrew Cyrille, Denis Charles, Cecil Taylor, Archie Shepp, Roswell Rudd, Reggie Workman, Charles Gayle, Rashied Ali, William Parker, Susie Ibarra, David Murray, 'Butch' Morris, John Hicks, Ku-Umba Frank Lacy, James Spaulding, James Newton, Regina Carter, Abbey Lincoln, Sonny Simmons, Marty Ehrlich, Frank Lowe, Makanda Ken McIntyre, Cecil Bridgewater, Jackie Mclean, Dee Dee Bridgewater, World Saxophone Quartet and many, many more. A great high-quality gift, modestly priced at $49.95.